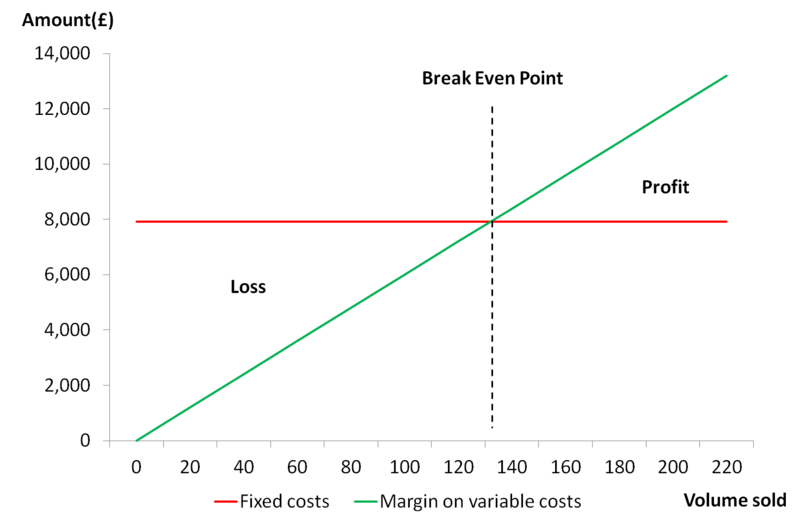 The breakeven point is the volume of sales required for the company to reach profitability. The breakeven point can be expressed in volume, in value, or in days of revenues. The breakeven point is reached when the margin on variable costs generated by the company equals the total amount of its fixed costs. Let's take the example of a shop. The shop sells its products at an average of £100/unit, has a rent of £660/month for sole fixed cost, and buys the products its sells at £40/unit. As you can see, the company will break even after 132 sales, i.e. when the total margin on variable costs equals the annual amount of the rent of £660/month x 12 months = £7,920.